In May of last year, some 5000 trafficked migrants from Myanmar’s Rakhine State and neighbouring parts of Bangladesh found themselves stranded on boats in the Andaman Sea. Regional governments at first refused to allow the boats to land, but the Malaysian and Indonesian governments finally relented and allowed the migrants to come ashore. Chastened by the spotlight thrust upon them in the wake of the boat crisis, the Thai, Myanmar, Malaysian and Bangladeshi governments made a concerted effort to crack down on human trafficking at sea across the region. By almost any measure, they have been successful. According to the UNHCR’s maritime movements monitoring unit in Bangkok, some 31,000 people attempted to cross the Bay of Bengal by boat in the first half of 2015, mostly intending to reach Malaysia as their final destination. Since 2012, the UNHCR estimates that some 170,000 people have made the crossing , and maritime movements across the Bay of Bengal have occurred on a consistent basis for at least a decade before that. By contrast, there were no confirmed sailing attempts in the first half of 2016. A team of Xchange monitors, based in six townships in northern Rakhine State and in three locations in Cox’s Bazar district in Bangladesh, were actively looking for evidence of seaborne outward movements from February 2016 onwards. They did not find any, and also found extreme reticence to depart by sea owing to knowledge of the horrors endured by those that survived. At time of writing, in mid-June 2016, the monsoon season is in full swing, making it unlikely that any sort of maritime movement will reoccur until at least the last quarter of this year – and that will only be the case if trafficking networks are, in fact, able to resume their activities. Although the crackdown in the wake of the boat crisis has halted the boats for now, the underlying factors that prompted the exodus in the first place have not diminished in any way. The human trafficking syndicates were initially established to spirit away desperate Rohingya Muslims from Myanmar’s westernmost Rakhine State, although opportunities for profit ultimately led the traffickers to recruit impoverished Bangladeshis with duplicitous promises of a better life abroad. The Rohingyas, often referred to as “one of the world’s most persecuted minorities” by activists and the press, are denied citizenship under Myanmar’s draconian 1982 citizenship law. They are considered by the Myanmar government and the Burmese public to be “illegal immigrants” from neighbouring Bangladesh, despite the fact that the vast majority can trace back their ancestry in Rakhine State for many generations. In conjunction with Migrant Offshore Aid Station's (MOAS) search-and-rescue and monitoring mission this sailing season in the Bay of Bengal, Xchange, as the "research and analysis arm" of MOAS, conducted a survey in Rohingya communities over a two-month period between March and May 2016 throughout central and northern Rakhine State, and among Rohingya refugees in the Cox’s Bazar district of south-eastern Bangladesh. A team of fourteen data collectors collected survey data using a mobile phone-based application, and the questions were intended to gauge attitudes towards migration among the Rohingya population in order to provide statistical substance to what has historically been opaque and anecdotal due to the isolation of the populations in question. The data collectors’ second function was to act as early-warning agents to inform MOAS of any confirmed boat departures. Xchange also hired an additional dedicated monitor in the port town of Shahporir Dwip, Bangladesh, on the tip of the Cox’s Bazar-Teknaf peninsula, a location well-known for seaborne human trafficking in years past. Ultimately, they did not have any movements to report. As best as can be ascertained by Xchange, there were no departures in the time immediately preceding or following the survey period. The findings from the survey indicate that, although Rohingyas in both Bangladesh and Myanmar are currently unable to leave by sea due to the crackdown on trafficking across the region, grim realities have, by and large, not improved over the last year. A plurality of respondents indicated that they were thinking of leaving their current place of residence in some capacity –although the vast majority showed an aversion to travel by boat, many of respondents were all too aware of the perils faced by those that brave the crossing. "5000 trafficked migrants from Myanmar’s Rakhine State and neighbouring parts of Bangladesh found themselves stranded on boats in the Andaman Sea." "Since 2012, the UNHCR estimates that some 170,000 people have made the crossing, and maritime movements across the Bay of Bengal have occurred on a consistent basis for at least a decade before that." "The Rohingyas, often referred to as one of the world’s most persecuted minorities by activists and the press, are denied citizenship under Myanmar’s draconian 1982 citizenship law. " "Rohingyas in both Bangladesh and Myanmar are currently unable to leave by sea due to the crackdown on trafficking across the region." Who Are the Rohingya and Why Do they Flee? Even before the 1982 citizenship law was passed, life for the Rohingyas was defined by violence and marginalization. Mass expulsions – most notably in 1978 and 1991/1992 – sent hundreds of thousands over the border to Bangladesh, where they remain to this day. Most of those in Bangladesh do not have access to adequate services and, as refugees, have limited mobility rights and opportunities. Rohingya woman in Teknaf camp, Bangladesh. The Rohingya trace their lineage to the 1500s and before, when there was a sizeable Muslim population living under the Buddhist Mrauk-U dynasty that ruled Arakan (Rakhine). The first documented usage of the term “Rohingya” was collected by British explorer Francis Buchanan in 1799, but the term developed political overtones only in the post-colonial era. After the British conquest of Arakan in 1825, the new colonial power encouraged massive immigration from neighbouring Bengal. The contemporary Rohingya population likely descends from both those that arrived during this period and Muslim populations in the region prior to the advent of British rule. Tensions with the state’s ethnic Rakhine Buddhist majority – and the central government – have long been fraught, and have become increasingly so in the recent past. After military strongman Ne Win seized power in 1962, the government promoted an official list of 135 “national races” that were deemed to be “indigenous” to Myanmar (then Burma). This list, with roots in colonial categorisation of peoples, was highly arbitrary, and Ne Win added and removed classifications at will. But what is most problematic is the entire premise of such a list: that a country needs an officially sanctioned list of “national races” is intrinsically flawed, because identity and ethnicity are inherently fluid and arbitrary, and has resulted in a system that legally enshrines second-class citizenship – or no citizenship – into perpetuity. The Rohingya did not appear on this list, even though the civilian government prior to Ne Win’s ascent tolerated the term. After 1982, in order to be eligible for “full” citizenship under Myanmar’s new stratified citizenship law, Rohingyas have had to provide documentary evidence that their ancestors resided in Rakhine prior to the British conquest – a burden of proof impossibly high for them to clear. Others may be eligible for “naturalised” citizenship – the lowest category, which can be revoked – if they renounce their claim to Rohingya identity and adopt the government’s preferred designation of “Bengali,” a term they find derisive as it implies they are illegal immigrants and perpetual foreigners, not integral members of the country entitled to the same rights as everybody else. In 2012, two bouts of violence, in June and October, displaced more than 140,000 Muslims in Rakhine State, mostly near the state capital, Sittwe. The clashes are widely believed to have been orchestrated by elements within the security forces and government, as well as ethnic Rakhine Buddhist nationalists . The violence left scores dead, and resulted in the apartheid-like separation of Muslims and Buddhists in the state capital and the rest of the state. Most of Sittwe’s Muslims now reside in Spartan internment camps on the periphery of the city, which served as a major point of departure by boat between 2012 and 2015. Denied livelihoods and subject to mobility restrictions, the displaced are reliant on meagre aid provided by international agencies. Mobility restrictions in the rest of the state have likewise hardened since 2012. In order to travel legally between townships in Rakhine State, Rohingyas need to apply for permission with local authorities, and these permits are often not authorised. Rohingyas found in breach of immigration rules face stiff prison sentences. Routine and arbitrary violence meted out by the authorities has remained a fact of life before and after the 2012 violence. The mobility restrictions Muslims are subject to have had a devastating effect on living standards. Malnutrition is rife, and access to healthcare is almost nonexistent. To service camps for the displaced, the government and NGO partners operate poorly-supplied “mobile clinics,” but more serious conditions require a referral to Sittwe General Hospital, which cannot be obtained without the permission of the authorities, and which can be difficult to acquire. Basic services, like camp management and food distribution, are at the behest of government-appointed committees, comprised of Rohingyas, who are notoriously corrupt. It is perhaps unsurprising that 2012 marked the beginning of a surge in seaborne human trafficking, as desperation began to mount back home. "The Rohingya trace their lineage to the 1500s and before, when there was a sizeable Muslim population living under the Buddhist Mrauk-U dynasty that ruled Arakan (Rakhine). " "If they renounce their claim to Rohingya identity and adopt the government’s preferred designation of Bengali, a term they find derisive as it implies they are illegal immigrants and perpetual foreigners. " "In order to travel legally between townships in Rakhine State, Rohingyas need to apply for permission with local authorities, and these permits are often not authorised." Rohingya flows from May to June 2015. Seaborne travel from northern Rakhine to Malaysia via Thailand gained momentum in 2006, according to the Arakan Project, an NGO that has monitors seaborne migration in the region, although a few boats sailed from the mid-1990s when travel restrictions in Rakhine began to be tightened. The Arakan Project’s estimates for sea departures doubled each year until 2008, when Thailand initiated a policy of setting boats adrift on the high seas – a policy that resulted in very few movements in 2009, 2010 and the first half of 2011. When Thailand began to show more lenience towards seaborne smuggling and trafficking in the latter half of 2011, the floodgates opened again, and the total numbers of people who made the sea journey showed a sharp and sustained increase following the 2012 violence until the mid-2015 crackdown in the wake of the boat crisis. The Rohingyas who departed Burmese and Bangladeshi shores by sea by and large did so willingly, but as the sea route became more popular, the offers put to would-be migrants by smugglers amounted to a bait-and-switch, and clearly fit the definition of human trafficking. Individuals –often children– were approached by agents of traffickers in villages and refugee camps, offering cheap or free passage overseas – usually, to Malaysia, and told in many cases that they could pay off debts when they arrived on the other side. They were then usually put on small boats –often departing in the dead of night– to larger boats anchored offshore in international waters, often being transferred between multiple boats by traffickers. The traffickers were known to issue their human cargo with coloured wristbands, denoting which trafficker the person being trafficked “belonged” to. Fishing boat at Teknaf, Bangladesh. Until the second half of 2015, these departures were widely ignored by the authorities, with widespread suspicions that well-connected people in Bangladesh and Myanmar were benefiting directly from the trade. One of the major points of departure since 2012 –Ohn Daw Gyi beach near Sittwe– is home to a large police station, and those who left from there would have needed to be driven right past it in order to leave by sea. Those being trafficked faced an arduous journey at sea. Often, they had to wait on boats offshore to fill up for weeks before they could begin the journey southward, and likewise wait on the other side before they could be offloaded. Food and water were scarce. Space was at a premium. Without adequate space to move, cramped quarters led, in some cases, to permanent injury. Violence perpetrated by the traffickers, including sexual violence against women, was rampant. 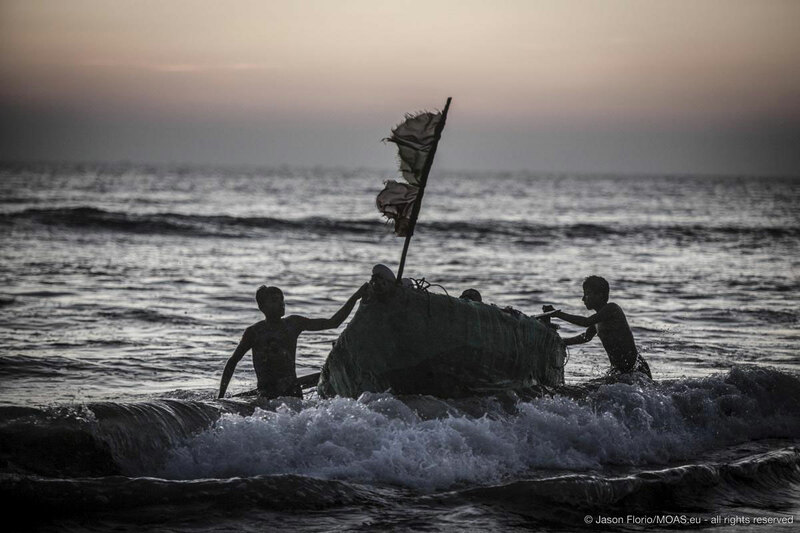 The UNHCR estimates that 370 migrants died on the Bay of Bengal route in 2015, noting that these deaths did “not [occur] from drowning but from mistreatment and disease brought about by smugglers who abused and in many cases killed passengers with impunity.” The Bay of Bengal sea route, the UNHCR says, was three times more deadly per capita for migrants in 2015 than routes across the Mediterranean . Thailand was historically the primary staging area for transhipment used by traffickers. Survivors of the journey were transported to remote camps operated in the jungle on both sides of the Thai-Malaysian border, islands in the Andaman Sea off the Thai coast, or, towards the end of last year’s migration crisis, large ‘prison boats’ stationed offshore . Their families back home would then be told to arrange extortionate ransom payments, often reaching US$2000. For those whose families could not pay, the consequences were dire. Hundreds are believe to have perished in these jungle camps at the traffickers’ hands. The discovery of mass graves in Thailand in May 2015, and later in Malaysia, prompted a belated crackdown by the authorities in those countries, despite years’ worth of evidence documenting trafficking in the region that tied officials to the trade – including an officially-sanctioned programme that sold Rohingyas detained in Thailand’s overcrowded immigration detention system to human traffickers, who then sold them into slavery on boats serving the country’s massive, poorly-regulated fishing industry . In March 2016, Thailand started a trial of 92 defendants charged with human trafficking offenses –including Lt. Gen Manas Kongpan of the Royal Thai Army, the highest-level official charged with these offences to date. It is the largest human-trafficking trial in Thailand’s history. But critics claim that Manas’ arrest was merely the tip of the iceberg, designed to show the world that Thailand was taking seriously its commitments to improve its trafficking-in-persons record and, in the process, avoid trade sanctions threatened by both Washington and Brussels. Thailand has also launched tracking mechanisms and spot-checks at sea to help ensure that fishing boats do not use slave labour as part of a broader program to combat illegal, unreported and unregulated (IUU) fishing . Last December, Police Maj. Gen Paween Pongsrin, the head of the investigation into human trafficking in Thailand, claimed asylum in Australia, citing death threats against him if he continued his investigation, which ended with his departure . If Paween’s account is to be believed, this would imply that senior figures in the Thai establishment that profited from human trafficking have not been brought to justice. Thus, there is a risk that if Thailand lets up on the ongoing crackdown, dormant trafficking rings will reactivate, and human trafficking across the Bay of Bengal will transpire once more. "Seaborne travel from northern Rakhine to Malaysia via Thailand gained momentum in 2006." "Individuals were approached by agents of traffickers in villages and refugee camps, offering cheap or free passage overseas to Malaysia." "According to UNHCR, the Bay of Bengal sea route was three times more deadly per capita for migrants in 2015 than routes across the Mediterranean." "Survivors of the journey were transported to remote camps operated in the jungle on both sides of the Thai-Malaysian border." "In March 2016, Thailand started a trial of 92 defendants charged with human trafficking offenses – including Lt. Gen Manas Kongpan of the Royal Thai Army, the highest-level official charged with these offences to date." Poimapper data collecting system was used in the surveys. A team of 14 Rohingya enumerators conducted this survey over a two-month period between March and May 2016. Their coverage areas encompassed six townships in Rakhine State, Myanmar (Maungdaw, Buthidaung, Rathedaung, Kyaktaw, Sittwe and Pauktaw) as well as the two primary camp areas in Cox’s Bazar district of Bangladesh (Kutupalong and Nayapara), generating a total of 1000 responses. For the purposes of easy classification, the survey area has been subdivided into three geographic regions: Cox’s Bazar district in Bangladesh, Maungdaw and Buthidaung townships (collectively “Northern Rakhine”), and Sittwe, Rathedaung, Kyauktaw and Pauktaw townships (“Central Rakhine”). A key challenge for accuracy was a lack of reliable population numbers for Rohingyas in both Bangladesh and Myanmar. Because the Myanmar government officially denies that Rohingyas exist, it has not made reliable population numbers publicly available. Myanmar held its first nationwide census in more than three decades in 2014, but Rohingyas were not counted. Myanmar’s Ministry of Immigration and Population estimates that 1,090,000 people in Rakhine State were not counted during the census, which can thus serve as a workable estimate of the number of Rohingyas currently resident in Rakhine State . The picture is similarly murky in Bangladesh. Some 32,000 Rohingya refugees are officially registered with the UNHCR, but scores more reside in the country without any official status. The Bangladeshi government recently conducted a census of Rohingyas resident in the country, which concluded in mid-June. While the official results of the census will reportedly not be released until November or December of this year , Bangladeshi media reports claim that the census revealed a total Rohingya population in the country of roughly 330,000 . Although Bangladeshi citizens made up a large proportion of last year’s sea departures, it would be very difficult to get an accurate picture of Bangladeshi attitudes to migration as the population size is large and difficult to define. As such, the decision was made to limit the responses to Rohingyas only in Bangladesh. There may have been responses from other Muslim minorities in Rakhine State, such as Kamans who live under segregated conditions alongside Rohingyas. Although Kamans technically have full citizenship rights, they are also subject to much of the same mobility restrictions as Rohingyas are, and as such are subject to similar living conditions and have similar grievances . The survey did not ask respondents to declare what ethnicity they define themselves as being. "Myanmar’s Ministry of Immigration and Population estimates that 1,090,000 people in Rakhine State were not counted during the census." "Bangladeshi media reports claim that the census revealed a total Rohingya population in the country of roughly 330,000." Has your living situation improved, gotten worse, or stayed the same over the past year? Do you believe it is possible to leave from where you currently live? Are you currently thinking about leaving from where you currently are? What ways do you think it is possible to leave? * The response "by plane" is based on their own perception, being that feasible or not. Who will cover the expenses of the journey if you leave? Where do you want to leave for? Do you have family abroad? Does your family send you money from abroad? How did your family leave? Did your relatives hold passports when they left? What kind of identification do you hold? Do you receive food aid? Is the food aid provided by the WFP? Have you been approached by agents soliciting you to leave by boat? Where did the agents who approched you say they could take you? Have you heard about risks/hazards associated with the sea voyage? Have you heard about the outcome of the November election in Myanmar, and the new government which took office on April 1? Do you think life will improve for you and your family under the new government? Have the risks/hazards associated with the sea voyage made you less inclined to leave by boat? 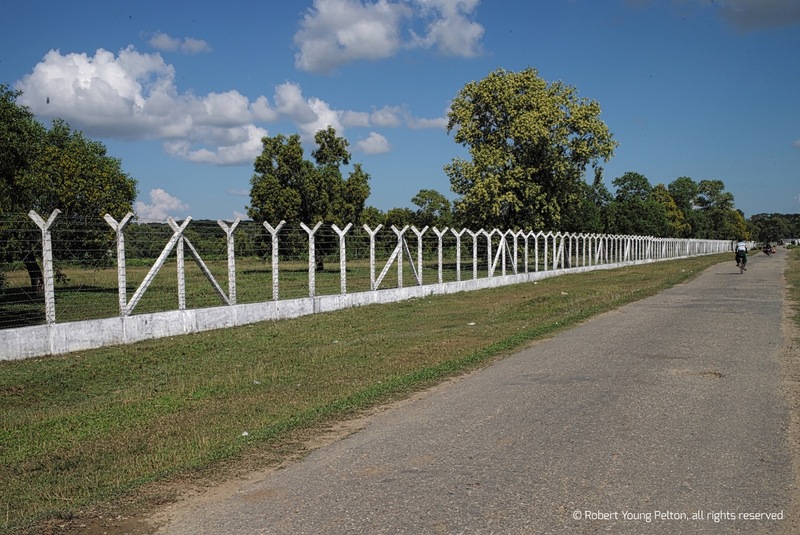 IDP fence at Sittwe, Myanmar. Respondents across the survey region indicated, for the most part, that their living standards had either stayed the same or declined over the past year. About half across the board felt it was possible to leave from their current places of residence. An overwhelming majority of respondents in Bangladesh –83%- indicated they were currently making plans to leave in some capacity. This is perhaps unsurprising, as those in Bangladesh are, in some cases, able to illegally obtain Bangladeshi passports, which they can then use to travel. For all respondents, Malaysia was by far the preferred destination. The same goes for Myanmar. For Rohingyas in Rakhine State, it is technically possible to get travel permissions from local authorities that could permit them to travel to Yangon, which likely explains the perceived feasibility of air travel as a mode of departure. Once they arrive in Yangon, Rohingyas are occasionally able to acquire Myanmar passports and use those to travel internationally. It should be noted, however, that these travel permits allowing them to leave Rakhine are seldom issued, making this possibility aspirational for most. A few attempt overland journeys from Rakhine to Yangon and further afield. Exchange's monitors reported a handful of individuals making overland journeys and being caught by the police, but this was an extremely rare occurrence despite the fact that survey respondents claimed that they felt that leaving overland was more feasible than other flight options. Doing so, however, is extremely fraught and expensive. Anecdotally, Rohingyas reported paying more than US$1000 to smugglers to bring them to Myanmar’s commercial capital, claims which are backed up by media reports . Unsurprisingly, few are able to travel overland, owing to both cost and the risks of getting arrested and facing a lengthy prison sentence on immigration charges. There does not appear to have been a spike in overland departures this year, despite the fact that other means of leaving the area are now less feasible. This is due both to risk and cost, and likely that most people who have the financial means to leave the area, at exorbitant cost, already have. The survey team collected anecdotal evidence of travel between northern Rakhine and Bangladesh with India, where there are established communities of Rohingyas, many of whom fled there following the 2012 violence. Communities have congregated in places like Muslim-majority Kashmir and Hyderabad, which has a long Mughal-Muslim history and large Muslim population . The most striking finding was the perceived infeasibility of the sea route across the Bay of Bengal. Across all regions, just 5% of respondents said they believed it was possible to leave by sea – in stark contrast to a year prior, when tens of thousands departed this way. The majority of Rohingyas have been touched by seaborne migration and trafficking in some capacity: 56% of all respondents indicated that they had relatives who had departed by boat in years past. This stark shift can only be attributed to the crackdown by all governments in the region on the trans-Bay of Bengal trafficking route, and underscores the fact that the message that crossing by sea is impossible has made it back home. A full 78% of respondents indicated that they were aware of the dangers and privations of the sea voyage, and indicated that this knowledge would negatively influence their decision to make the trip across the ocean. "The Rohingya's living standards had either stayed the same or declined over the past year." "The majority of respondents in Bangladesh –83%- indicated they were currently making plans to leave in some capacity. " "Rohingyas reported paying more than US$1000 to smugglers to bring them to Myanmar’s commercial capital." Across all regions, 43% of respondents indicated that they had family abroad, and 65% of those respondents indicated that they receive remittances from them. Malaysia was, again, overwhelmingly where family abroad resided. 56% of respondents with family abroad said their family members departed by sea, with air travel second at 29%. Despite the fact that it has no commercial airports, half of the respondents in Maungdaw and Buthidaung townships (“northern Rakhine”) reported that their family members left by plane, which is likely to indicate that they travelled to Bangladesh first and acquired passports there. "43% of respondents indicated that they had family abroad." In Rakhine State, the majority of respondents indicated that they were holders of “White Cards” – temporary, non-citizen identification documents. Some respondents in Bangladesh reported holding these cards, as well. On April 1, 2015, these documents were deemed invalid by the authorities, who then proceeded to collect them and issued their holders with receipts indicating that they had been confiscated . The large “other” field, with regards to the types of identification held, particularly in Northern Rakhine State, is largely comprised of respondents who are in possession of these receipts. In either case, whether respondents hold invalidated white cards or receipts for returned ones, these documents are not legally accepted forms of identification and do not grant their bearers any form of citizenship rights. A small minority of respondents reported holding “green cards” entitling them to “naturalised citizenship” under Myanmar’s stratified 1982 citizenship law – a distinction that applies even if the holder’s family has been resident in the country for generations. Although this should, in theory, entitle them to full mobility rights around Myanmar, in Rakhine State they are usually subject to the same restrictions as those without citizenship documents. Roughly one-third of respondents in Bangladesh reported that they held UNHCR asylum seeker cards. "Only 3% of the respondents reported holding green cards entitling them to 'naturalised citizenship' under Myanmar’s stratified 1982 citizenship law." 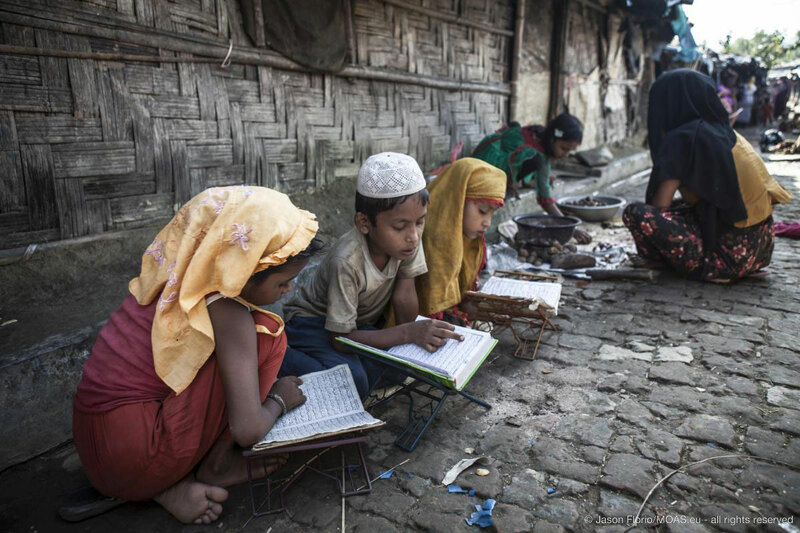 Children studying in an IDP camp, Bangladesh. 57% of respondents claimed they felt their lives would improve after Myanmar’s new, democratically-elected government took office in March, following landmark elections in November that saw Myanmar elect its first truly civilian administration in more than a half-century. Denied citizenship and basic decency for decades, Rohingyas have expressed some faith that the National League for Democracy (NLD), led by long-time opposition figure Aung San Suu Kyi, will demonstrate a willingness and ability to alleviate their plight – hopes that have not as yet been borne out by the NLD’s actions. In Myanmar’s last election, held in 2010, the government permitted Rohingyas to cast ballots using the “white cards” as identification. They rewarded the military-derived Union Solidarity and Development Party (USDP) in kind, electing Rohingya USDP candidates to represent Maungdaw and Buthidaung townships. Their votes were used as a bulwark by the establishment against rising ethno-nationalist political sentiment by the state’s ethnic Rakhine Buddhist majority. But since the 2012 violence, anti-Rohingya discourse in Myanmar has become particularly virulent. The former government was not willing to raise the nationalists’ ire in the run-up to November’s polls, and the Rohingyas were not allowed to vote in the last election. Myanmar’s new government is now four months into its mandate. It is difficult to see signs that the NLD intends to ameliorate the Rohingyas’ predicament in any meaningful way. In May, the government resumed a ‘citizenship-verification’ process in Rakhine, an earlier iteration of which was launched and scuppered by the previous government the year before and which only provided “green cards,” the lowest rung of citizenship, for a few hundred individuals. Like prior efforts at ‘citizenship verification,’ the latest program does not recognise the Rohingyas’ right to call themselves what they please, and as such has been widely rejected by the Rohingyas themselves. In Myanmar, political rights are closely intertwined with collective, ethnic rights. Members of groups that are not on the official list of 135 are not recognised – and so, to assert they have as much a right to full, equal rights as any other native-born inhabitants of the country, many Rohingya activists today unequivocally emphasise their right to assert their chosen identity. Indeed, that notion that citizenship will serve as a panacea, and will force the government to end the crippling mobility restrictions is a falsehood, as Kaman Muslims with full citizenship as well as “green card” holders are still subject to apartheid-like ghettoization and marginalization despite citizenship status that should legally emancipate them from these restrictions. The stakes are high: accepting anything less than full citizenship with their chosen nomenclature, the thinking goes, is the first step towards even greater marginalisation or perhaps even expulsion. This is no idle threat. A copy of the government’s "action plan" for Rakhine leaked to the media in 2014 called for Rohingyas to be “resettled” in third countries with UNHCR facilitating the de-facto ethnic cleansing of Rakhine State, a prospect that the UN agency was quick to distance itself from . In March, UNHCR announced that some 25,000 Rohingyas displaced in the 2012 violence had been resettled to their places of origin and given materials to rebuild their homes. While this is a positive development, the returnees were mostly displaced to areas relatively close to where they came from originally. Most of the 140,000 Muslims displaced by the 2012 violence were forced out of Sittwe, the Rakhine State capital, and around 100,000 remain confined to an archipelago of camps outside of the city to this day – and bringing them back to the city will pose a vexing challenge. There is a pervasive fear in many circles that the internment camps in Rakhine State, particularly around Sittwe, will become permanent fixtures on the landscape. Much like the old government, the new government in Rakhine State –and Myanmar more generally– has touted development as a panacea for Rakhine State’s ailments . This narrative has been generally supported by international actors operating in the state, particularly the United Nations Development Programme (UNDP). But this line of thinking obfuscates the fact that the poverty Rohingyas and other Muslims in Rakhine State is largely the function of politics. The mobility restrictions they face are man-made constraints, and alleviating their predicament will require political will –which seems to be in short supply. For humanitarian agencies operating in Rakhine, donor fatigue has set in. Faced with massively contracting budgets globally due to the Syrian refugee crisis, the World Food Programme (WFP) has gradually reduced food aid to Rakhine State despite the fact that needs have not changed in any meaningful way. Aung San Suu Kyi, the de-facto head of the new government, has urged foreign agencies and governments to not use the term “Rohingya,” advising they be referred to as “the Muslim community in Arakan State” and ethnic Rakhines “the Buddhist community in Arakan State” . While the NLD establishment is very much prone to anti-Muslim sentiment and xenophobia, this was primarily a move to appease Rakhine Buddhist nationalists. The principal ethnic Rakhine political party, the Arakan National Party (ANP), enjoys far greater levels of support and loyalty in the state than the NLD does. The ANP has close ties to the Arakan Army (AA), which has conducted a low-level insurgency in Rakhine since April 2015, and the government does not want the insurgency to spiral out of control despite the Arakan Army’s limited capacity to inflict real damage. The NLD’s unwillingness to engage with the issues head-on is at best amateurish, and not befitting the seriousness of the problems at hand. Their disinclination to address the nomenclature issue is a cop-out that will invariably leave the Rohingyas stranded in limbo, hanging on to an increasingly ephemeral hope that the government will recognise them as citizens on their own terms. Meanwhile in Bangladesh, Xchange data collectors and other sources on the ground have indicated that as the government there has progressed with the census, it has sent out signals to the local population that it intends to repatriate Rohingyas to Myanmar, a prospect that has left many there fearful for what the future will bring. The last time Bangladesh repatriated Rohingyas to Myanmar was in 2005 , and with the census completed, many fear that it is only a matter of time until Dhaka decides to send more back over the border and into harm’s way. Of the surviving migrants who survived last year’s boat crisis and were disembarked in Malaysia and Indonesia, the Bangladeshi citizens have, for the most part, been repatriated. Although a one-year deadline imposed by Kuala Lumpur and Jakarta on Rohingyas being resettled in third countries has come and gone, nearly 400 survivors of the boat crisis remain in indefinite detention in Malaysia’s Belantik immigration detention centre in dismal conditions while they await resettlement . Hundreds more rescued around the time of the 2015 boat crisis remain subject to indefinite detention in centres in Thailand. Those who disembarked in Aceh, Indonesia, got a much warmer welcome from the surrounding community and some protection from the local government. But because job opportunities were few and far between, and out of a desire to reunite with family in Malaysia. Ground sources confirmed many hundreds paid smugglers to transport them by boat – again – across the Malacca Strait to peninsular Malaysia in late 2015 and early 2016, a trip that can be very deadly in its own right. The net impact on outward migration caused by Myanmar’s ongoing persecutory policies and Bangladesh’s attempts to manage its refugee populations remain to be seen. If hope continues to fade for the Rohingya in Myanmar, their initial faint hope in the new government may soon give way to frustration if the NLD does not tackle the issues head-on. The feasibility of actually being able to leave, be it by sea, overland, or by plane, is of course in question. If the Thai government continues to crack down on its maritime sector and establish safeguards to improve its dismal human trafficking record, the likelihood of large-scale sea movements resuming in late 2016 or 2017 is unlikely. But pent-up demand to leave is not something that can be ignored. As this survey shows, the desire to find a better life away from the privations and injustices of Rakhine and Bangladesh is strong, and how this desire will manifest moving forward is an extremely important factor to watch. "Rohingyas have expressed some faith that the National League for Democracy (NLD)...will demonstrate a willingness and ability to alleviate their plight." "In Myanmar, political rights are closely intertwined with collective, ethnic rights. Members of groups that are not on the official list of 135 are not recognised." "Green card holders are still subject to apartheid-like ghettoization and marginalization despite citizenship status that should legally emancipate them from these restrictions." "The mobility restrictions they face are man-made constraints, and alleviating their predicament will require political will – which seems to be in short supply." "The feasibility of actually being able to leave, be it by sea, overland, or by plane, is of course in question." As an information and research initiative, we are eager to work with a wide spectrum of stakeholders to exchange information and knowledge on the Rohingya issue.